DasCoin, the global blockchain technology solutions provider, looks set to skyrocket after listing on three public cryptocurrency exchanges following its public event, DasCoin: The Evolution of Money at the O2 Arena, London attracting more than 3,000 crypto enthusiasts. CoinFalcon (https://coinfalcon.com) is one of the first exchanges to list DasCoin, along with BTC-Alpha and EUBX. 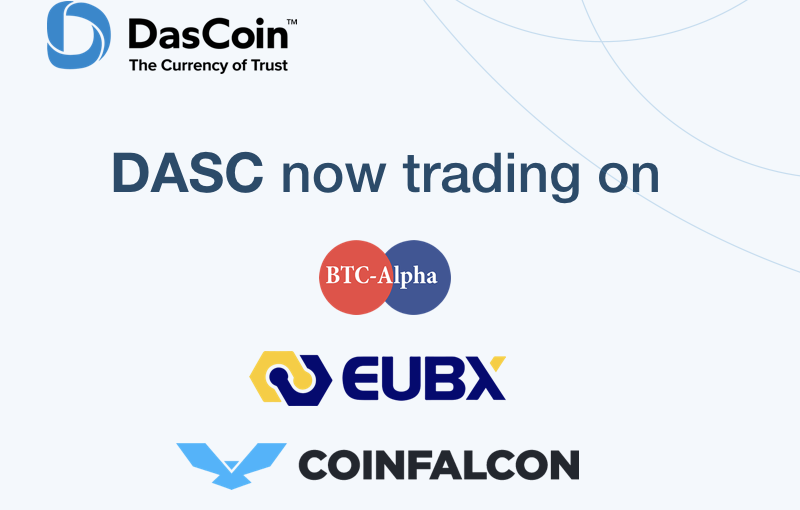 The CoinFalcon listing, which appeared live on April 27 2018, includes trading pairs DasCoin (DASC) with BTC, ETH and Euro Trading and is part of the overall plan by DasCoin, branded The Currency of Trust, to bring crypto-currency to the mainstream. Across the three new exchanges, traders will be able to buy and sell DasCoin with USD, Euro, BTC and ETH. DasCoin, founded in 2016 by visionary Michael Mathias, draws on the strengths of both traditional currencies and emerging digital currencies while addressing their weaknesses. Its super-fast blockchain has capacity to process up to 100,000 transactions per second and it is built upon Graphene technology and BitShares, a peer-to-peer, decentralized, distributed ledger which has been in use since the early days of cryptocurrency and is used by three of the top 10 Blockchains in the world. The new exchange listing represents a milestone in the company’s history and is the first in a series of announcements to be made by the company. Forthcoming announcements are set to include further exchange listings, (which could include HitBTC). Up p to 10 new ICO partners, some of whom made presentations at the recent event in London, are set to utilize DasCoin blockchain. Meanwhile, NetLeaders, DasCoin’s decentralized marketing community, is gaining rapidly in popularity and has authenticated the DasCoin proposition in more than 100 countries worldwide, including Poland, UK, Nigeria, Germany and Philippines. There has been growing interest in the DasCoin blockchain-powered ecosystem, with its vision to lay down a global bedrock of trust that unlocks prosperity for everyone. By eliminating the problems of traditional money and adapting trust to the digital age, the team at DasCoin feels this will create a better system for holding and exchanging value and could be the best long-term currency hold as well as one of the biggest gainers in 2018. On April , 2018, DasCoin released its codebase onto Github to ensure that every piece of information in its’ blockchain can be shared or queried, making DasCoin’s blockchain fully transparent. Additionally, DasCoin are not “mined” like those of Bitcoin and other “proof-of-work” coins. Instead DasCoin utilizes a “minting process” which results in a significant reduction in energy consumption, as well as a more equitable distribution of value. Michael Mathias, CEO of DasCoin, said: “Public trading is a significant milestone in the DasCoin story, and listing on these initial exchanges is a testament to the interest in our unique blockchain solutions model. It fulfils the promise of a huge amount of work by DasCoin and continues to build upon the launch of our proprietary blockchain in March last year. It’s a time-tested stock market strategy – snapping up stocks in the hope of earning quick gains once the stocks start trading, so now could be a good time to buy DasCoin. Crypto-currencies have attracted a lot of interest of late with more than $400 billion of tradable crypto-assets and ICOs raising more than $13bn for blockchain-related start-ups. The first 90 days of launch often sees the biggest gains. How do commission-free exchanges make money? Global Blockchain Forum to Destroy Token Fest?